This paper explores how teachers utilize representations in their teaching. 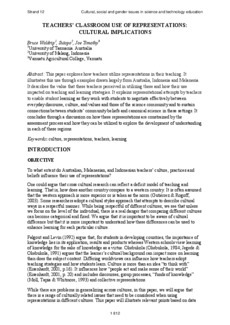 It illustrates this use through examples drawn largely from Australia, Indonesia and Melanesia. It describes the value that these teachers perceived in utilizing these and how their use impacted on teaching and learning strategies. It explains representational attempts by teachers to enable student learning as they work with students to negotiate effectively between everyday discourse, culture, and values and those of the science community and to sustain connections between students’ community beliefs and canonical science in these settings. It concludes through a discussion on how these representations are constrained by the assessment process and how they can be utilized to explore the development of understanding in each of these regions.